2015 Zuani ‘Vigne Bianco’ (Friuli-Venezia Giulia)| Cue: 'The Hills Are Alive' from The Sound of Music and transport to the Collio appellation of northern Italy! A full-bodied Pinot Grigio blend with notes of peach, lemon, and melon. Patrizia Felluga is the 5th generation winemaker dating back to late 19 century Istria, Croatia. In 2001, she acquired the vineyard from a well-known old farmer after her husband passed away. Growing only white grapes, she and her two children make delightul wines longing to be enjoyed under the sun. 2013 Pravis 'Le Frate' Nosiola (Trentino-Alto Adige)| This Nosiola that grows on slopes that overlook tranquil lakes is named 'Le Frate' which translates into 'the friars'. Dedicated, serene, and as jovial as its namesake, this wine humbly presents hazelnut and white flowers notes. Brilliant straw yellow with a green shimmer. Rich in the mouth, with a slight smokiness at the back and a good, fresh finish. 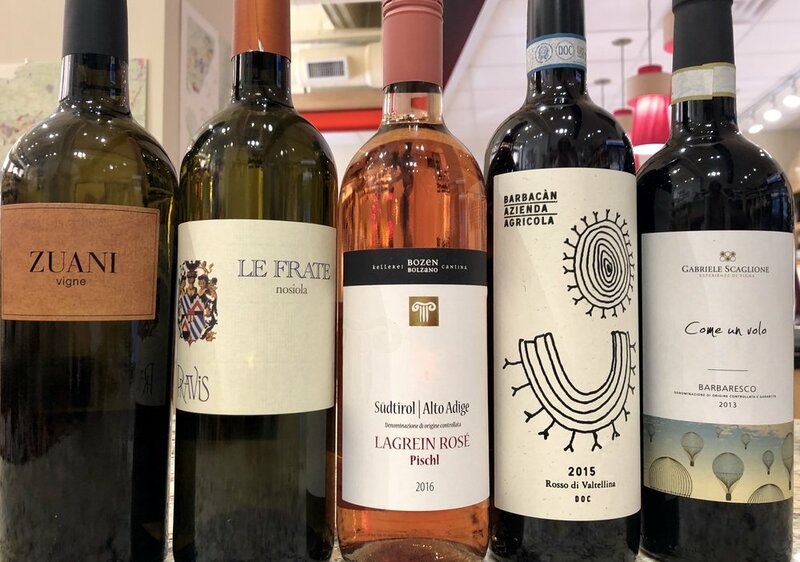 2017 Cantina Bolzano, Lagrein Rosato (Trentino-Alto Adige)| The featured rosé from the Lagrein grape is from Cantina Bolzano, one of our favorite South Tyrol wineries run by Klause Sparer, and legendary Kellermeister (winemaker) Stephan Filippi. With vineyards planted between 240 and 800 meters above sea level, this rosé has the brightest acidity of any rosé you’ve tasted recently! It’s quenching, inviting, and full of notes of cranberries and raspberries. 2015 Barbacàn, Rosso Di Valtellina (Lombardy)| Angelo Sega and his sons Luca and Matteo this Nebbiolo at a vineyard that neighbors the Swiss border in the Italian Alps. This Chiavennesca (the local name for Nebbiolo) is what one would pack on a trek up a mountain. It's berry fruit and earthy herbaceous are just what one would need to quench one’s muscles and soul! 2013 Gabriele Scaglione "Come un volo" Barbaresco (Piedmont) | Gabriele Scaglione uses absolute minimal use of pesticide treatments, creating wines of rich aroma and flavor. A recent visit at the shop from Gabriele proved that his wines are just as charming as the winemaker himself! This Barbaresco (100% Nebbiolo) is elegant with soft tannins and aromas of roses and a bowl full of fresh cherries. It’s the perfect housewarming gift (we’ve also got it in a magnum! ), or open alongside a steak and some roasted veggies fresh off the grill!